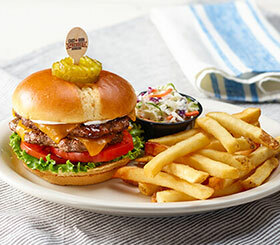 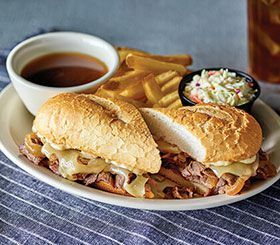 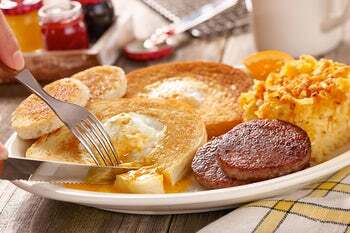 Cracker Barrel Old Country Store - Tualatin Food Delivery | WeDeliverEats | Use discount code 1STORDER to get your first delivery free! 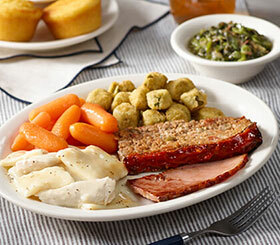 A hearty sampling of our Chicken n’ Dumplins, Meatloaf and Sugar Cured or Country Ham. 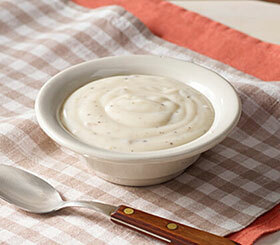 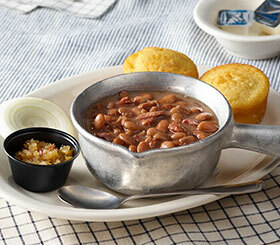 Served with three country sides and homemade Buttermilk Biscuits or Corn Muffins. 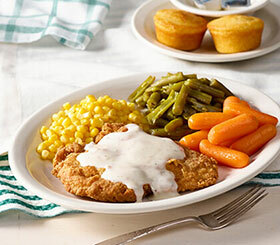 A generous portion of our deep-fried chicken breast fillet topped with Sawmill Gravy. 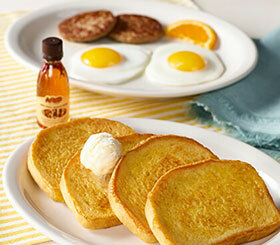 Served with three country sides and homemade Buttermilk Biscuits or Corn Muffins. 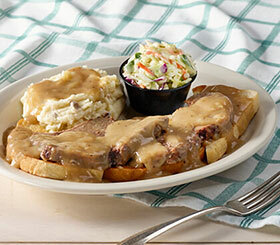 A generous portion of our USDA Choice steak breaded and deep fried then topped with our own Sawmill Gravy. 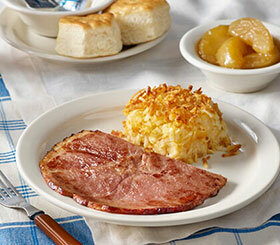 Served with three country sides and homemade Buttermilk Biscuits or Corn Muffins. 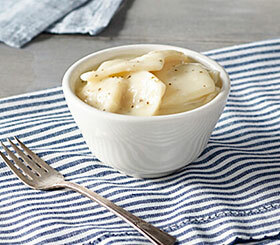 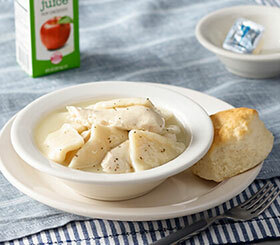 Our classic, slow simmered Chicken n’ Dumplins is available in two sizes. 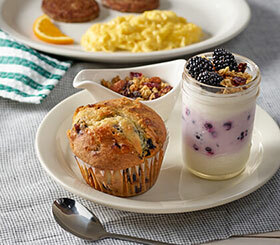 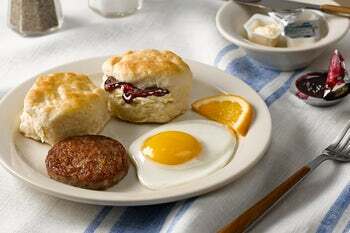 Served with two or three country sides and homemade Buttermilk Biscuits or Corn Muffins. 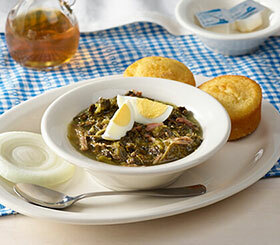 Served with two country sides and homemade Buttermilk Biscuits or Corn Muffins. 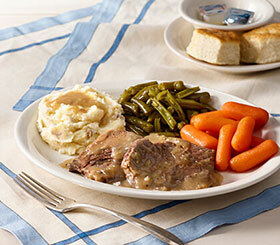 Our thick-cut USDA Choice chuck roast is slow roasted up to 14 hours until fork tender. 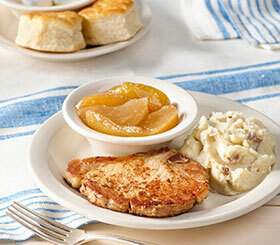 Served with three country sides and homemade Buttermilk Biscuits or Corn Muffins. 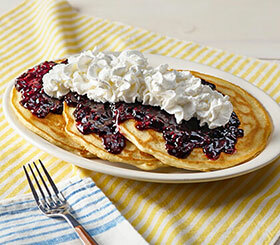 Folks have been enjoying these favorites for years. 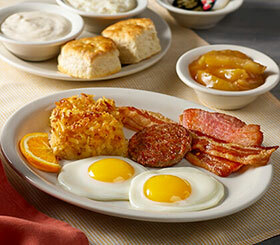 We use ingredients like Grade A farm fresh eggs, Coarse Ground Grits, our own special Golden Delicious Fried Apples, Thick-Sliced Hickory-Smoked Bacon and Country or Sugar Cured Ham. 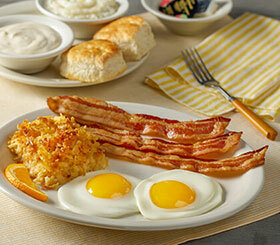 Three eggs* with grits and a full order of Thick-Sliced Bacon and Smoked Sausage Patties plus All the Fixin’s. 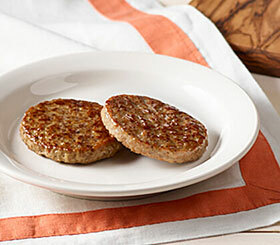 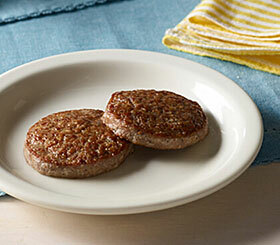 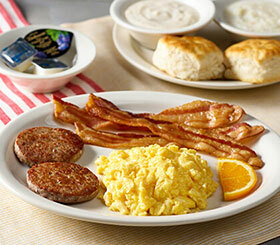 Two farm fresh eggs* with grits plus Turkey Sausage, Thick-Sliced Bacon or Smoked Sausage Patties. 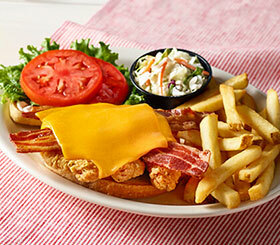 Comes with All the Fixin’s. 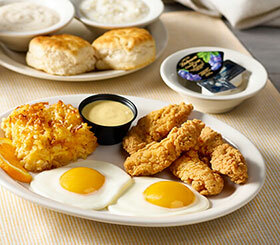 Two farm fresh eggs* with grits plus All the Fixin’s. 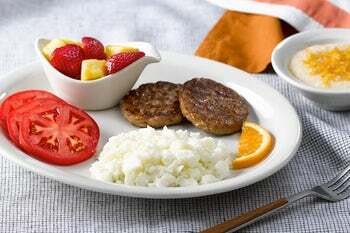 Two Scrambled Egg Whites, Coarse Ground Grits, a side of Fresh Seasonal Fruit, sliced tomatoes and Turkey Sausage. 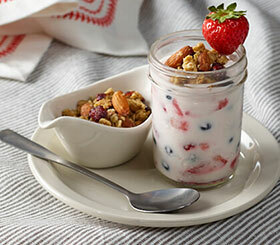 Low-fat vanilla yogurt and Fresh Seasonal Fruit topped with honey oats, almonds and dried fruit granola. 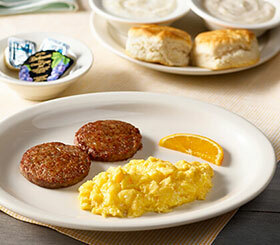 Served with two Scrambled Egg Whites and Turkey Sausage. 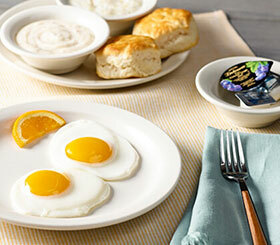 One egg* served with Buttermilk Biscuits, butter and preserves. 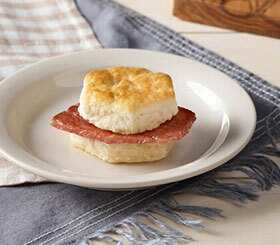 Starts with two hand-rolled Buttermilk Biscuits. 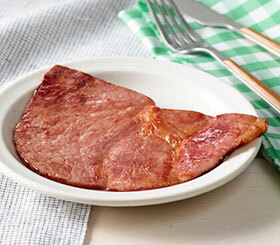 Plus choice of ham, sausage patty or Thick-Sliced Bacon. 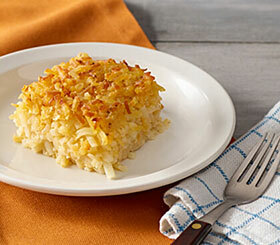 Served with Fried Apples or Hashbrown Casserole. 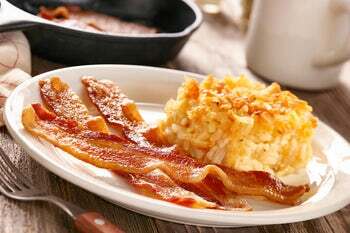 Choice of a full order of Thick-Sliced Bacon or sausage patties with Fried Apples or Hashbrown Casserole. 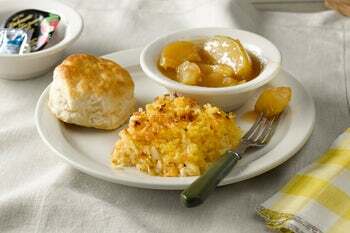 Our Hashbrown Casserole with Fried Apples and a Buttermilk Biscuit. 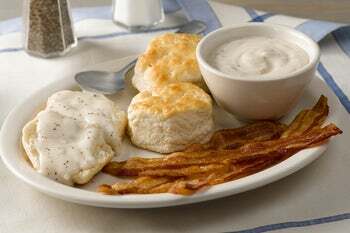 Three Buttermilk Biscuits with Sawmill Gravy. 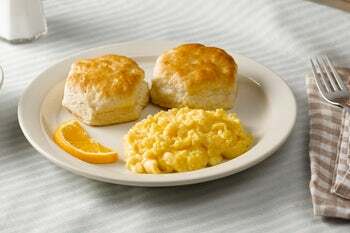 Two eggs* with two homemade Buttermilk Biscuits. 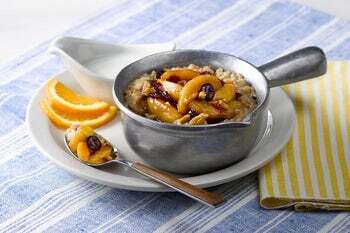 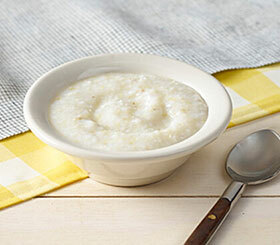 Hearty steel-cut oats simmered ‘til creamy with dried cranberries, apples, golden raisins, cinnamon and vanilla. 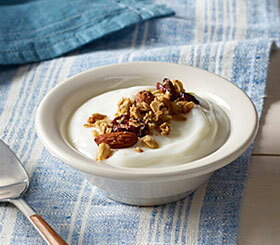 Topped with roasted Fuji apples, dried cranberries and pecans. 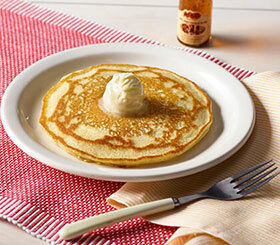 Served with reduced fat milk. 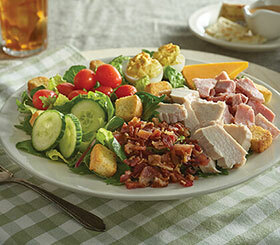 Made with the finest ingredients and prepared fresh when you order. 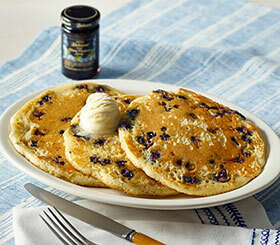 Each comes with a warm bottle of our 100% Pure Natural Syrup n’ butter or any Sweet Topping of your choice. 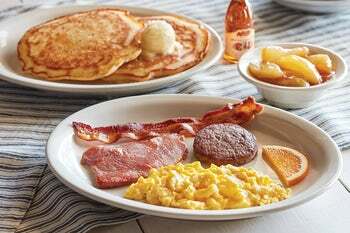 Starts with two Buttermilk Pancakes n’ butter served with two eggs* and a sampling of Thick-Sliced Bacon and Smoked Sausage. 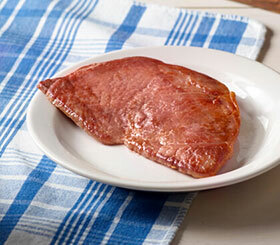 Plus a sampling of Sugar Cured or Country Ham (90/140 cal). 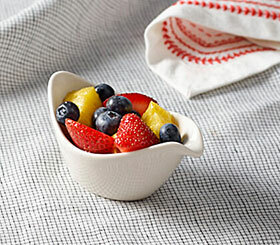 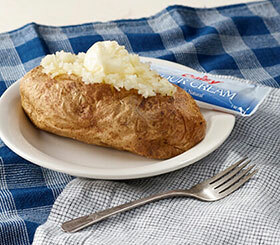 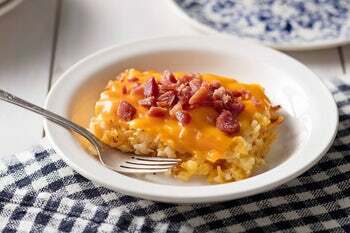 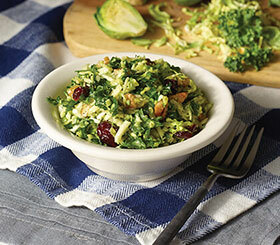 Served with Fried Apples or Hashbrown Casserole (170/190 cal). 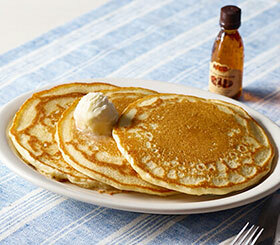 Plus 100% Pure Natural Syrup. 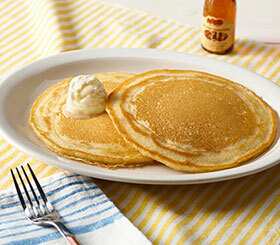 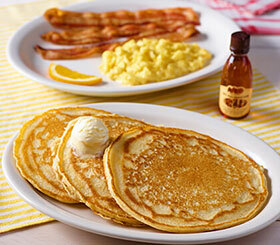 Three Buttermilk Pancakes served with two eggs* with 100% Pure Natural Syrup n’ butter and Thick-Sliced Bacon or sausage. 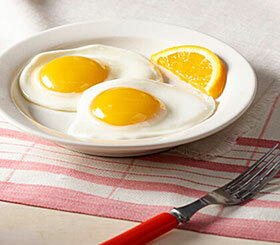 Two slices of Sourdough bread, each grilled with an egg* in the middle. 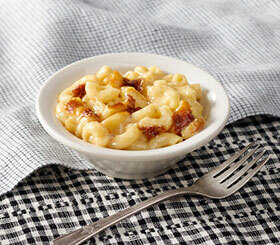 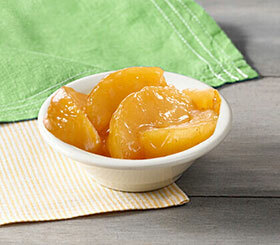 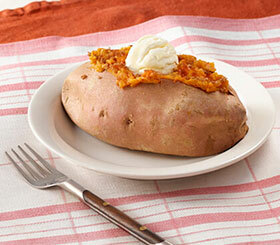 Plus Fried Apples or Hashbrown Casserole (170/190 cal) and Thick-Sliced Bacon or sausage (110-240 cal). 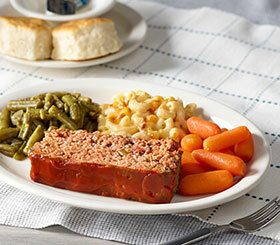 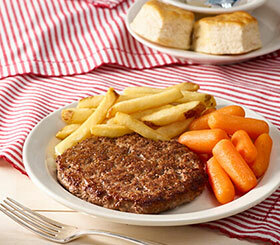 A thick slice of our special recipe Meatloaf made with tomatoes, onions and green peppers. 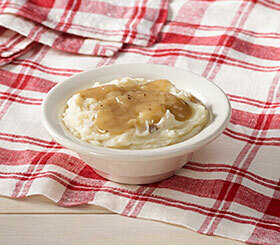 Served with three country sides and homemade Buttermilk Biscuits or Corn Muffins. 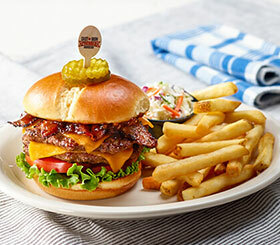 Our thick-cut USDA Choice rib eye is aged 28 days for exceptional tenderness and flavor, lightly seasoned and grilled to order. 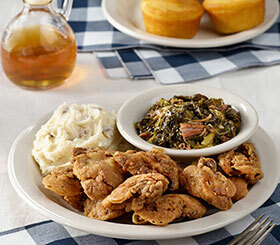 Served with three country sides and homemade Buttermilk Biscuits or Corn Muffins. 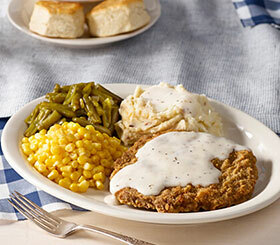 Served with two country sides plus homemade Buttermilk Biscuits or Corn Muffins. 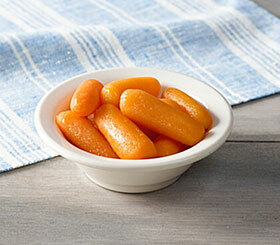 Our 8 oz. 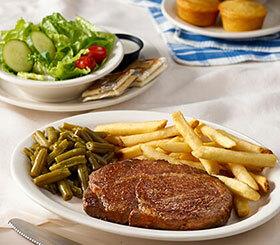 USDA Choice top sirloin, seasoned and grilled to order. 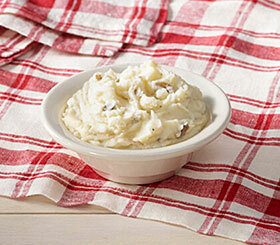 Served with three country sides and homemade Buttermilk Biscuits or Corn Muffins. 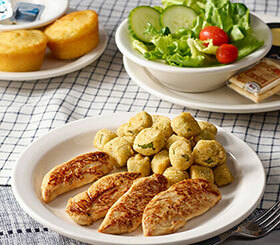 Choose four or six chicken tenderloins grilled to perfection. 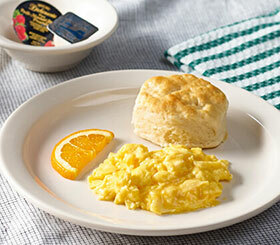 Served with two or three country sides and homemade Buttermilk Biscuits or Corn Muffins. 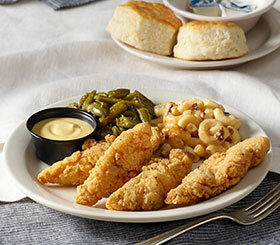 Choose four or six chicken tenderloins fried till crispy, served with BBQ or Honey Mustard sauce. 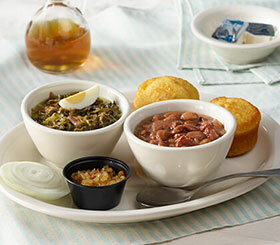 Served with two or three country sides and homemade Buttermilk Biscuits or Corn Muffins. 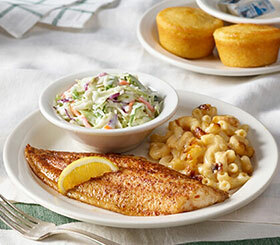 Choose one or two spicy, grilled U.S. farm-raised catfish fillets. 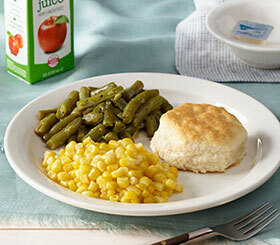 Served with two or three country sides and homemade Buttermilk Biscuits or Corn Muffins. 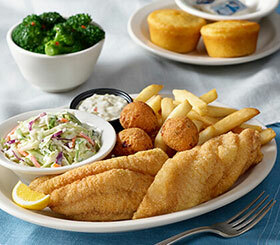 Choose one or two cornmeal breaded U.S. farm-raised catfish fillets fried golden. 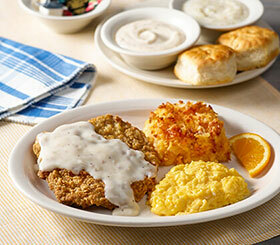 Served with two or three country sides and homemade Buttermilk Biscuits or Corn Muffins. 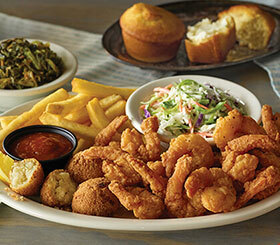 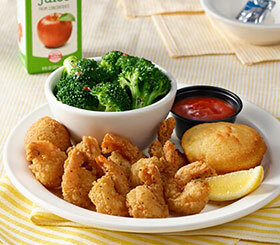 A hearty portion of our sweet buttermilk breaded fried shrimp served up with hushpuppies. 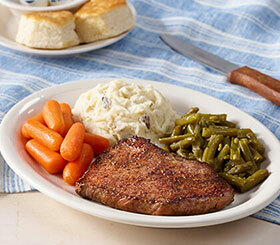 Served with three country sides and homemade Buttermilk Biscuits or Corn Muffins. 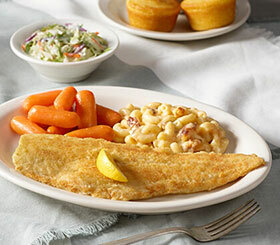 Our North Atlantic boneless whitefish fillet dusted in traditional cornmeal and flour mix and grilled until fork tender beneath a light, crispy crust. 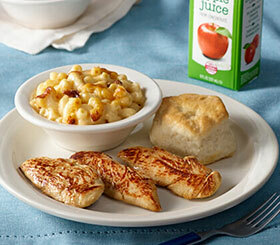 Served with three country sides and homemade Buttermilk Biscuits or Corn Muffins. 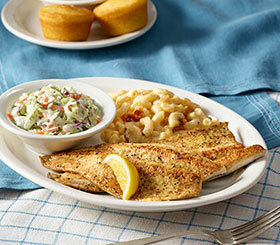 Choose one or two seasoned boneless spring water trout fillets grilled until tender. 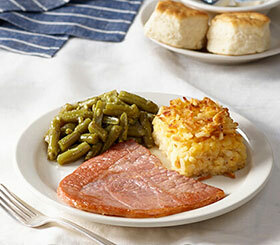 Served with two or three country sides and homemade Buttermilk Biscuits or Corn Muffins. 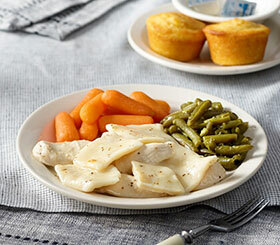 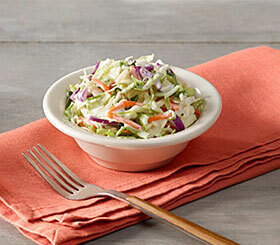 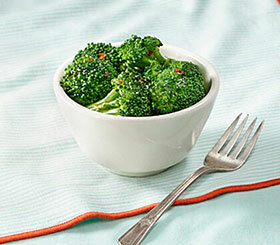 Comes with three or four vegetables (15-310 cal/ea.) 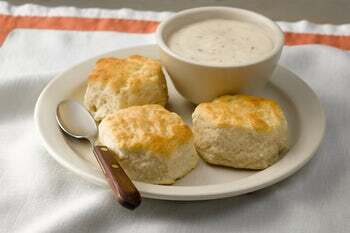 plus homemade Buttermilk Biscuits or Corn Muffins. 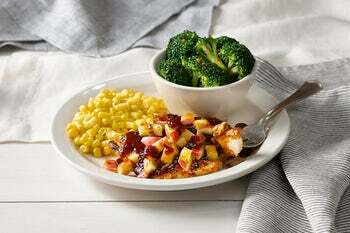 Our grilled chicken breast, seasoned with smoky Southern spice and topped with zesty apple cider BBQ sauce, and a fresh Gala apple n' dried cranberry chutney. 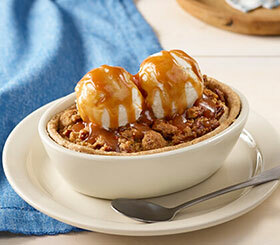 Served with two country sides. 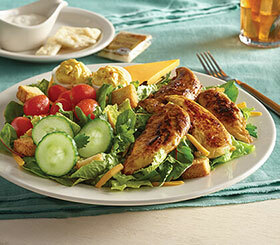 Grilled chicken breast over Romaine lettuce tossed in Buttermilk Caesar dressing. 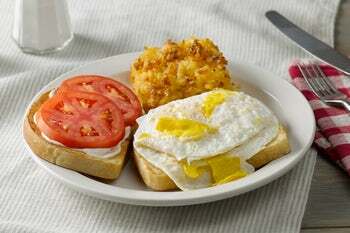 Topped with shaved Parmesan, grape tomatoes, house-baked Sourdough croutons and two deviled eggs. 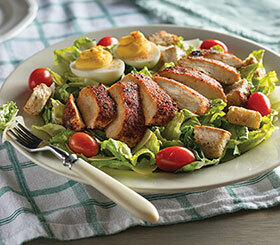 Grilled chicken tenders over fresh greens with grape tomatoes, shredded Colby, two deviled eggs, house-baked Sourdough croutons and a Colby cheese wedge. 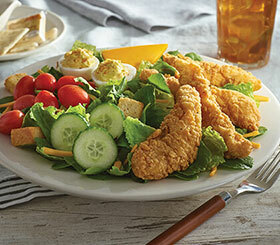 Fried chicken tenders atop fresh salad greens with grape tomatoes, shredded Colby, two deviled eggs, house-baked Sourdough croutons and a Colby cheese wedge. 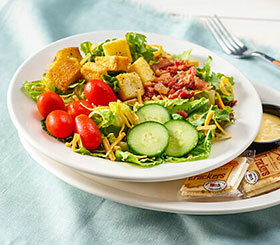 Salad greens topped with Oven Roasted Turkey Breast, pieces of Sugar Cured Ham and bacon, cucumber, grape tomatoes, a Colby cheese wedge, house-baked Sourdough croutons and two deviled eggs. 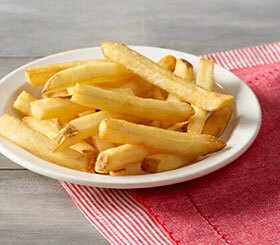 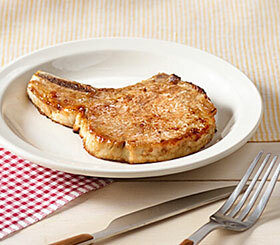 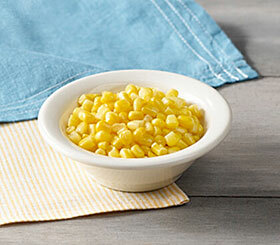 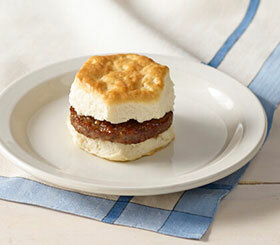 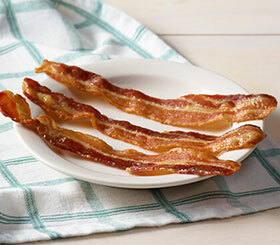 Served Fried with BBQ or Honey Mustard or Grilled plus a Country Side and a Buttermilk Biscuit or Corn Muffin. 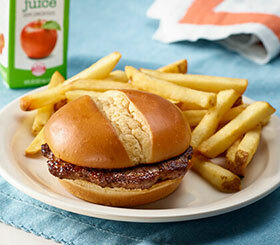 Includes an organic apple juice box or other select drinks. 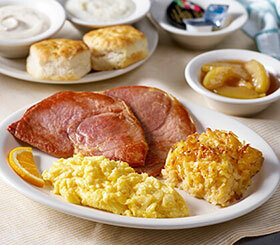 Served with a Country Side and a Buttermilk Biscuit or Corn Muffin. 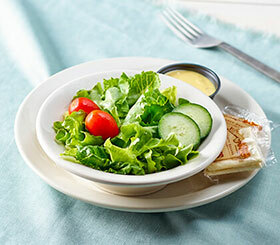 Includes an organic apple juice box or other select drinks. 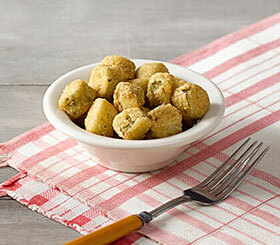 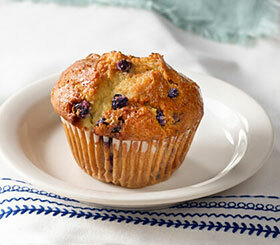 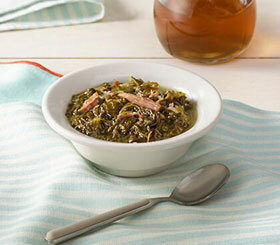 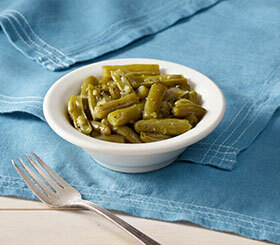 Served with a Buttermilk Biscuit or Corn Muffin. 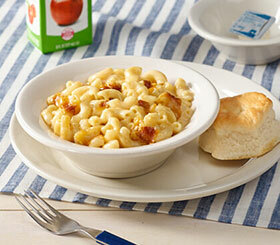 Includes an organic apple juice box or other select drinks. 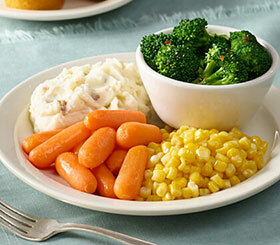 Served with a Country Vegetable. 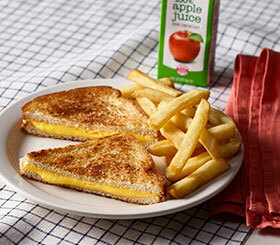 Includes an organic apple juice box or other select drinks. 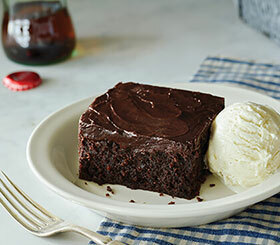 Rich, warm double chocolate fudge cake made with real Coca-Cola® and served with Premium Vanilla Ice Cream. 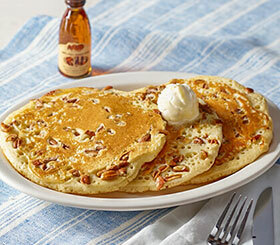 A true Cracker Barrel Old Country Store® tradition. 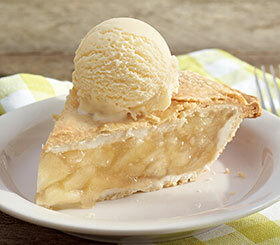 Served with no sugar added Premium Vanilla Ice Cream.